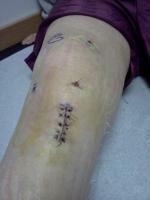 I had the above operation on 05/02/08, just 2 weeks ago.I had to wait 3 months for this even privately. I am a fitness fanatic and before my symptoms started in October, I was running x 3x5k per week plus aerobics and x3 step classes a week and if I'm truthful a bit more if I could fit it in. Prof Barrett has told me no more impact exercises so you can imagine how I feel!The knee swells to the size of an orange during the day.The physio has suggested that I start to use the bike and the X trainer but no walking on the treadmill. Do you think this is too soon given that there is still a lot of swelling? What exercises should I be doing? And if I must alter the type of exercises I do once recovered would "spin" be okay to try? My job is nursing and I am on my feet for 12 hour shifts at night - obviously still off till next week.